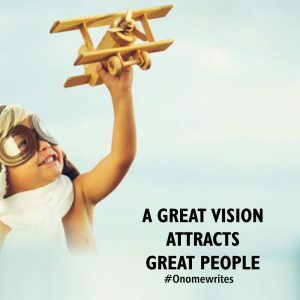 The oxford dictionary defines vision as an idea or a goal towards which one aspires. A dream births a vision and with a vision you are set to accomplish great things. A man who has a vision is like a pregnant woman, who at the beginning can be pushed so close to the edge that he would feel, wish or hope to take it all back and retreat to that comfort zone. Like a mother however, once he scales through, there is no greater joy than holding that wonderful baby that is the product of her labour. The sleepless nights do not matter anymore. When a vision is conceived and you are there laying the groundwork, trying and panting really hard and even sometimes being open to a helping hand; and yes, it can be as difficult as nobody taking notice nor seeing your labour (why should they, people only appreciate the finished product) but when that vision finally becomes a manifestation, the world pays you to breathe you. No matter what, don’t settle for less when you are designed for the very top. A real man should have a vision but at the same time he needs a confident woman to run that vision with. A woman’s place should not be underestimated and so it is very essential to have a woman who believes in your vision. A woman influences and quite conveniently is also a multiplier, anything you input in her she multiplies. It is not just enough to have any woman but a confident and passionate woman to support your vision. Let’s talk about a man, who had a vision, he is a man I personally love and respect. I’ve once heard this man say everything he is now he has seen years ago. This man had a vision and very importantly also had a confident woman who believed in his vision. Let’s talk about Revd. Sam Adeyemi of the Day star Christian centre. Pastor Sam Adeyemi is a Nigerian pastor, motivational speaker with special focus on positioning people for success and leadership qualities, He is the founder of Daystar Christian centre, president of Success Power international, He hosts a popular radio and television program called “success power.” Born on February 3rd 1967, a native of Yagba in Kogi state of Nigeria, Pastor Sam Adeyemi personify the saying that behind every success and achievements lies plenty stories to tell. Daystar Christian centre was on November 18, 1995 inaugurated at 4th floor of Eko Chinese hotel on Allen Avenue, Ikeja Lagos. Pastor Adeyemi recounts how tough things were for him in the beginning, when in 1994 he had to go on fasting and prayer with his wife, Pastor Nike Adeyemi, asking God to show him the next focus for his life and ministry and in July 1994 received the vision that lead to the establishment of Daystar Christian centre and success power international ministry. The church which currently is worth over 2 billion naira was in the early stage not able to pay its rent at several locations it had hold it church service in Lagos, Pastor Sam recalls how the manager of his rented church space chased his church workers out and warn against holding prayer meeting there, with the manager of the space occupying with his friend to play games in the rented hall and how he had to beg him to allow him hold service there that day, with promise he will pay by the end of the service, He recounts how the said manager sent an usher to him at about 10 minutes to the agreed hour even when the service was going on and he had to pause the service to collect offering so as to pay the manager. Today, that is history, as this humble and spirit-filled man of God has raised an army congregation of men and women with quality Christian leadership strength, with the church experiencing astronomical growth and success over the past two decades of ministry. Pastor Sam Adeyemi has authored several religious and biblical based motivational books including the bestselling -Success is who you are and Parable of Dollars. Other authored books include Ideas Rule the World, StartWith What You Have, Second Revolution, Multiply Your Success: LEAD and his latest additions: Nigeria of My Dreams, Generation Z+ and We Are the Government. Pastor Adeyemi is happily married to Nike Adeyemi and are blessed with 3 children. (Culled from recordsng.com). This is a man who had a vision and he ran with it. I don’t know where you are right now but understand that though your vision may look unattainable to a lot of people, if you believe in your dreams, your vision (the first step of which is believing) the world will celebrate you. Set yourself ablaze and the world will watch you burn! Everybody celebrates success but failure is an orphan. So, it’s time to pick up your vision again and start running. It’s not time to give up; every great man today had a vision yesterday. I challenge you to write the vision, make it plain and run with it. 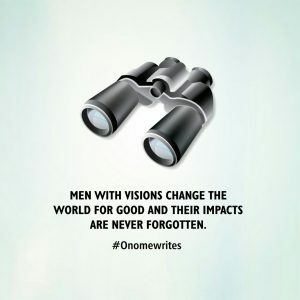 The world bows for men with a vision! It might not look like it right now but like Revd Sam Adeyemi, keep pursuing your goals; you will definitely get to the top. Wao! I love that. More grace . Awesome Onome……. 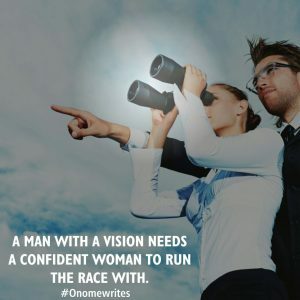 A man with vision needs a confident woman to run the race with.